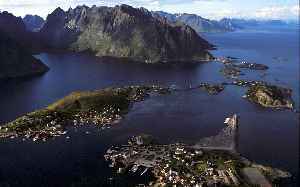 Lofoten is an archipelago and a traditional district in the county of Nordland, Norway. Lofoten is known for a distinctive scenery with dramatic mountains and peaks, open sea and sheltered bays, beaches and untouched lands. Though lying within the Arctic Circle, the archipelago experiences one of the world's largest elevated temperature anomalies relative to its high latitude.